Akit's Complaint Department: What's Causing the Clipper Card Reader Meltdowns? Beep beep beep beep beep (multiplied by several dozen times), but nobody is tagging their card... That's the sound of Clipper card readers on vehicles on a meltdown. This was brought to my attention through a cell phone recording and was also featured on Muni Diaries around two weeks ago. Before you hit play on that video, you might want to turn down your speakers. Even some people on Twitter are complaining of the readers going on meltdown. Here's one, and another. I've even noticed it myself when I was just leaving Embarcadero station from the ballgame and noticed some Muni employees staring at the N-Judah's card reader making those excessive beeping noises. It almost felt like the employee wanted to grab a baseball bat and take a swing at it. It brings out an interesting question, why in the heck are the vehicle readers acting up on Muni? This is a totally new phenomenon that has only been happening for the past month. If there are SFMTA/Muni and/or Clipper/MTC officials out there reading this, please comment back or e-mail me about why this is happening. I think the public has a right to know why these card readers are going nuts. If you have your own story about the card readers melting down, leave me a comment. I'd love to hear what you have to say. My bad. I triggered this annoying sound the other day on the 36. I believe the cause was, I had my plastic clipper card, and my wife's cardboard (short term use) clipper card, in the same sleeve of my wallet. When I tapped my wallet to the reader, it went nuts. Belliastime got it - this happens when two (or more) smart cards are tagged to the reader at the same time. We identified the issue a few months ago and have corrected the issue on the faregate and stationery (e.g. Caltrain and Golden Gate ferry) card readers. The software update that will fix the issue on the bus and LRV readers will be released in November. In the meantime, tagging the Clipper card separately (e.g. removing it from your wallet) or making sure there's not an RFID or smart card in the same holder as your Clipper card can prevent it from happening. If the continuous beeping is tripped, ask the vehicle's operator to restart the reader. If the operator doesn't do anything about it, the trick is to touch the Clipper reader with your hand - YES, WITH YOUR HAND! It works! No lie. Weird bug. Like Belliastime, late last month I had a Translink card (with Sept. pass) and a Clipper card (with no pass) in the same wallet. Tried to enter a BART station, but the fare gate told me to "See Agent." I removed the Clipper card, tapped the Translink card and entered. No crazy beeping. Will this glitch happen if I have an rfid credit card or Bling card in my wallet? As the Clipper folks just said, the problem only exists on the vehicle card readers, and not on the stationary and train gate readers. The problem with RFID cards is, if you have two or more in your wallet, reading them can scramble the signal resulting in errors. 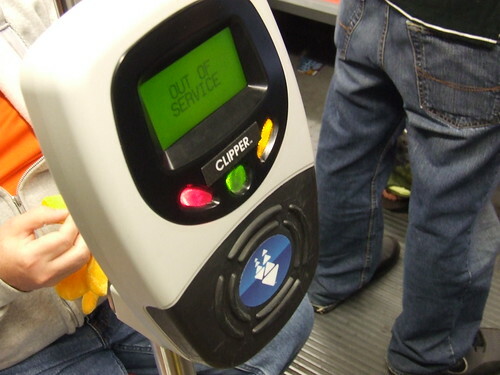 In Clipper's case, having a Clipper card and some other RFID card such as a work ID badge or those new credit/debit cards can cause errors. I encountered this problem today while boarding the N-Judah to head out to Caltrain. Every one of the Clipper readers were beeping madly. I can understand why some passengers or MUNI drivers want to take a baseball bat to them!. On the plus side, since I could not scan my card, I got a free ride out to Caltrain!